The bridge on the Adyar river at Manapakkam, was widened from 4 lane to 6 lane stretch and it includes a pedadtrian path, and the entire cost has come up to a sum of 13 crores. With more increasing time, roads need to be exponentially more than the cars which run, because the number of cars which have taken to the road are huge in number. This would naturally cause clogging of arterial roads, if the civil engineering part is not taken care of. All narrow roads too need to be expanded such that they hold enough capacity to let the traffic run smoothly. 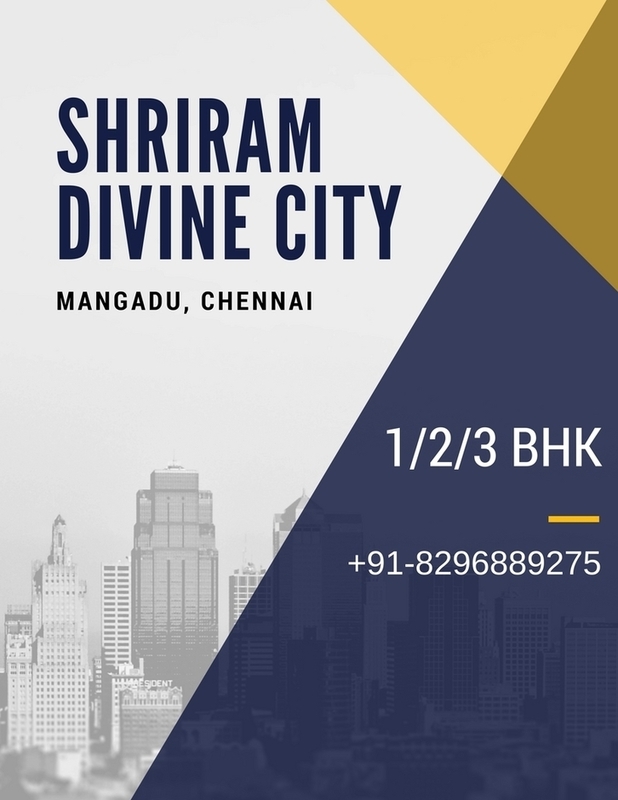 Shriram Divine City a residential property in this vicinity will have a boon after the development. The 135 m long bridge had a 100 m project on both sides of the bridge. This project was estimated to be completed in a period of about mid of January. The two metre long pathway will now let the pedestrians to safely cross the road, which was not the case earlier as they crossed the bridge on foot, and this was life risking and detrimental to road safety. The project also involved strengthening of the bridge, with the use of additional aprons, so that the bridge holds strong. Earlier this was not the case, and the safety of the bridge was highly compromised. Aprons were installed in the ends of the bridge, to hold together the bridge well, toe walls were added to retain the foundation, so that the bridge doesn't get washed away by water, as in the case of water flooding when the Chembarabakkam dam was opened, and the entire bridge was flooded. Concrete blocking was added under the river bed through which the bridge was passing, this was done to avoid the water from rising up and causing disturbance in traffic. Toe walling of at least 300 m will help the water to pass without any obstruction from under the bridge. The regular users and pedestrians who frequent this way will find newer ease to travel on the road that is commonly called Mount Poonamallee Road, and this would kill the choke, amake traffic smoother. The roads will be a relief to passers-by, ambulances, school buses, which are often stuck on traffic jams in this road. MIOT hospital patients always suffer from traffic congestions and get delayed, often leading to critical conditions. The residents and the drivers for very long time have been expecting developments on the road so that the arterial traffic isn't disrupted. The requirement of a water bridge was for long identified, and the poonamallee road for long needed this repair. The project also includes street lights, foot path for pedestrians and a median, which pretty much covers up the need list. Beautification and the landscaping will also be done, which will cost an extra charge of 1 crore. On the side of Guindy, planting trees and making a recreational spot will also be done. To enhance the smooth flow of traffic and foot walkers, the water bridge will contribute greatly. Slowly with time, the remainder roads need to be expanded the similar way to aid transport and communication. In this era of technology people want to reach on their destinations without waste of time in hurdles. Like students of world that are getting essay works from https://www.bestdissertations.com/ here without waste of time and money. Thanks for sharing this amazing this amazing photograph of your drawing. Amazing blog post indeed. Share more artistic posts please. I would recommend https://www.topcelebrityjackets.com/ryan-gosling-blade-runner-2-long-leather-fur-coat that you should start posting tutorials as well. I enjoyed over read your blog post. Your blog have nice information, I got good ideas from this amazing blog. I am always searching like this type blog post. https://www.edisoncarservice.com I hope I will see again. You can use this for any kind of academic writing work. I was searching for something like this for quite a long time and at last I’ve found it on your blog. It was definitely interesting for all users i must want to appreciate https://www.essaysolution.co.uk/write-my-essay your thoughts you have already shared though this post. It is very important for especially students for improvement of handwriting for explaining own ideas and skill. But now days such a big lost we cannot improve https://www.assignmenthelperuk.co.uk hand writing using of computer technology. I enjoyed over read your blog post. Your blog have nice information, I got good ideas from this amazing blog. I am always searching like this type blog post. https://www.glamourjackets.com/mission-impossible-6-fallout-tom-cruise-jacket I hope I will see again. You can use this for any kind of academic writing work. Good post. Thanks for sharing with us. I just loved your way of presentation. I enjoyed reading this .Thanks for sharing and keep writing. It is good https://www.essayhelperuk.co.uk to read blogs like this. As constantly, we appreciate yourself assurance and accept as true within us. It' actually a great and helpful piece of information. I am glad that you shared this helpful information with us. Please stay us up to date like this. Thank https://www.assignmentcrux.co.uk you for sharing.